Saints and angels, missionaries and Indians, artists and conservators populate this fascinating introduction to a house of spirit, a Sonoran Desert landmark, and an artistic bridge to another era. A richly illustrated story for young and old alike, it is the perfect book for families to share. Mission San Xavier: A Story of Saints and Angels, Art and Artists/Una Historia de Santos y Ángeles, Artes y Artistas tells the tale of the church of Mission San Xavier del Bac — its improbable rise in the eighteenth century in a vast desert, its decline over many decades by political and natural misfortunes, and its restoration and conservation by people who recognized spiritual and historical wealth in this place and found inspiration in its art. The book also introduces the reader to some well-loved saints of the Catholic faith. 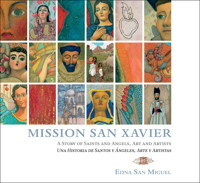 The story is illustrated with Edna San Miguel's charming interpretive paintings of the church history, architecture, statuary, and decorations, as well as the efforts of the international team of conservators who came to preserve its baroque art. Following the storybook section, a short "gallery of saints" highlights San Miguel's lively paintings of several saints depicted in the church. Each painting is accompanied by a paragraph on the life and work of that man or woman. For parents, aunts, uncles, and young adults, the book includes a brief history of the mission and the people who contributed to its construction and preservation. Another section details some of the technical challenges to the international conservators and the techniques they used. Mission San Xavier is a book about divine art, artfully designed, a delight to the eye and an inspiration to the spirit. Colorful, playful, uplifting. Artist extraordinaire, Edna San Miguel previously illustrated the multi-award-winning children?s book My Nana?s Remedies, by Roni Capin Rivera-Ashford also published by ASDM Press. San Miguel worked closely with an international team of conservators during their early efforts on the art at Mission San Xavier. .